According to the 2013 Minnesota Census of Women in Corporate Leadership, produced by St. Catherine University and co-sponsored by the Minnesota Women’s Economic Roundtable, women are gaining ground in corporate leadership positions statewide. Fifty-two of Minnesota’s 100 largest publicly held companies have both women in corporate directors and women executive officers. In 2008, women held 117 board seats and only four women were CEOs in the state’s top companies. 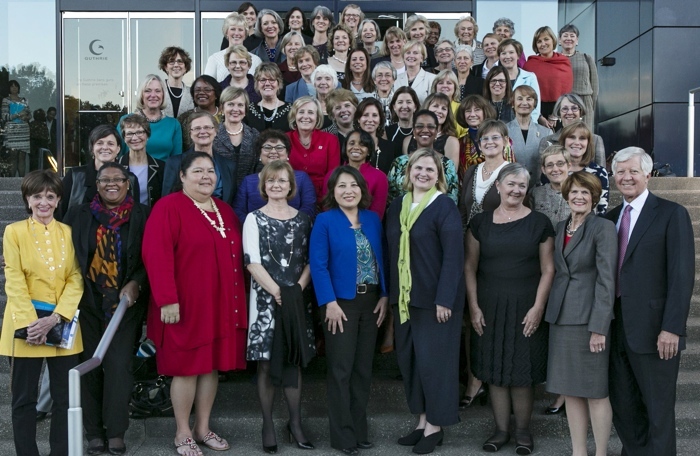 By 2013, there were 119 women board members and seven CEOs. The complete list of women leaders being honored is below. The mission of the George Family Foundation is to foster wholeness in mind, body, spirit and community by developing authentic leaders and supporting transformative programs serving the common good. The guiding philosophy of the George Family Foundation is to invest in people, programs and initiatives that further the mission of the Foundation and help build the communities in which we live. For more information, visit georgefamilyfoundation.org. Judy Lysne, Lifeworks Services Inc.
Lauren Segal, Scholarship America Inc.
Sally Smith, Buffalo Wild Wings, Inc.